A NEW HEADQUARTERS for the Department of Health was not used for 17 months – but the rent paid on it over that period by the OPW added up to €15.8m. That’s according to a new report from the Comptroller and Auditor General on the 2017 financial year, which found that there were a number of issues over the accommodation at Miesian Plaza, including how many staff needed to be accommodated and the layouts to be provided for assistant principal officers. The lease of Miesian Plaza was effective from December 2016. By April 2018, OPW had paid €15.8 million in rent and service costs. Taking account of advance payments as provided for in the lease and service charge balancing payments, the rent and service costs attributable to the period to end April 2018 were €14.1 million. While it is inevitable that there will be some period during which a newly acquired premises is unoccupied, the absence of a rent free period in the case of the Miesian Plaza lease meant that it was crucial to ensure that the premises were occupied as soon as possible after the commencement of the lease. It was intended that Miesian Plaza would be ready for occupancy from March 2017. This target date was not achieved — DCYA moved to Miesian Plaza in May 2018 with DoH moving in July 2018. Labour Party Health spokesperson and Vice Chair of the Public Accounts Committee, Alan Kelly TD said “serious questions need to be answered about wasteful spend in the Department of Health” following the release of the report. The fact that the Department is wasting €15.8 million in rent on a building that has remained vacant in a prime Dublin 2 area is completely and utterly wrong. In a statement, the Department of Health said “it is important to note that the Office of Public Works (OPW) has sole responsibility for procuring accommodation for Government Departments”. It said the OPW entered into a lease for Miesian Plaza to accommodate the headquarters of both the Departments of Children & Youth Affairs and Health, in addition to parts of the Departments of Finance and Public Expenditure & Reform. It said that the Department of Health had no role in the timing of the signing of the lease or the negotiation of the cost of lease arrangements for the building. The OPW continues to have responsibility for the overall lease arrangements. The Department of Health relocated to Miesian Plaza “at the earliest date the accommodation was available to us, over two weekends during July 2018″. The object was to achieve a modern accommodation that would continue to meet the needs of the Department for many years to come. The department said that the outcome of this detailed engagement “has proven to be beneficial in terms of the standard of accommodation achieved and the associated benefits in terms of business operations on a daily basis”. Meanwhile, the OPW said that Miesian Plaza is the largest acquisition that the OPW has secured in the country in recent years. “The move to this building is consistent with the OPW’s objective to upgrade its portfolio to modern fourth generation properties,” it said. The OPW said it “is committed to ensuring that public servants are accommodated in cost and energy efficient properties that are complementary to modern flexible work practices”. It said that it “is well documented that Hawkins House which accommodated the Department of Health had reached its end of life and was no longer fit for purpose”. 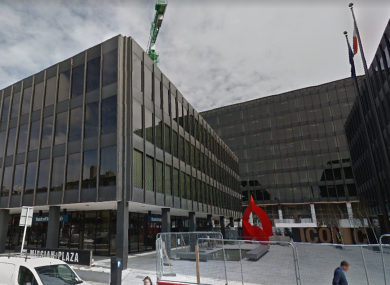 The OPW said that Miesian Plaza “is an exceptional property and an extremely competitive rent of €49.85 per sq ft was achieved in a continually rising market”. The move to Miesian Plaza will also release Hawkins House, a prime City Centre site for redevelopment which will yield a significant return for the State. It said that the fit out of any large scale commercial building “is a complex process and given the size and scale of the project a fit out period of 9 – 10 months would not be considered unusual”. However, there is no doubt that the move to Miesian Plaza represented significant challenges for the DOH and DCYA in addition to the OPW. The OPW worked intensively with both Departments to meet the challenge of balancing the clients’ requirements with that of the State’s property rationalisation programme and the move to modern open plan office accommodation. The challenge of meeting accommodation solutions of four Government Departments in addition to the move from cellular offices to an open plan working environment added a layer of complexity to the project which resulted in unforeseen delays. It said there is “some ambiguity about the method used to calculate the annual rent which arose due to the introduction of a new standard of measurement in February 2016 by which time the terms of the lease were substantially agreed”. This new standard has raised issues regarding the measurement of the building and the OPW is currently pursuing this issue with the landlord. The OPW concluded by saying it has put in place a number of measures and procedures to strengthen its approach to managing large scale projects. It is also undertaking a review of its operating procedures. Email “New Department of Health headquarters were empty for over a year - costing almost €16m”. Feedback on “New Department of Health headquarters were empty for over a year - costing almost €16m”.